The Gutshot Chick is ready to rumble! March 15, 2007 -- Lancaster, Penn. 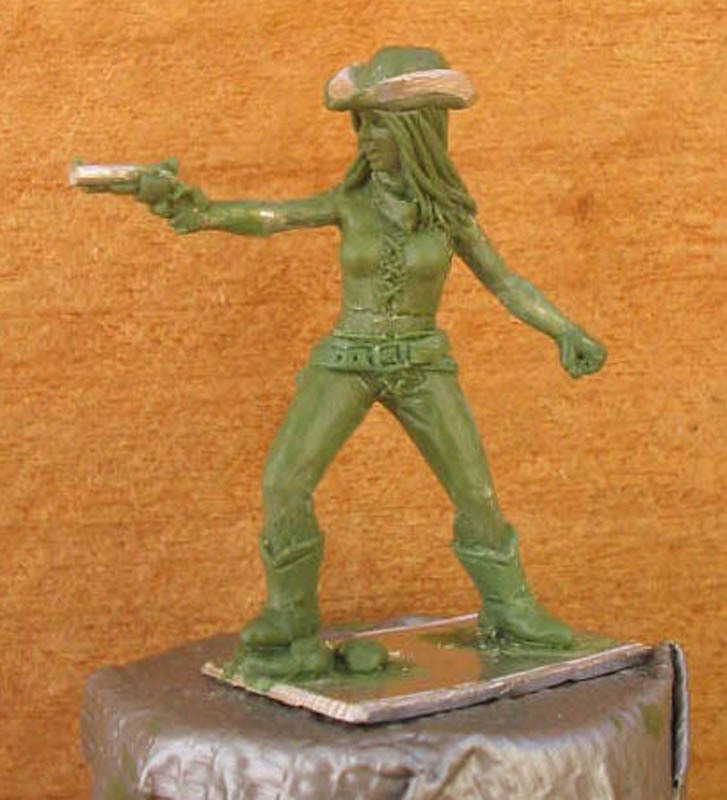 The artists model -- called a green -- for "The Gutshot Chick" shows that's she's not someone to be trifled with. The finished figures are cast in lead-free metal. 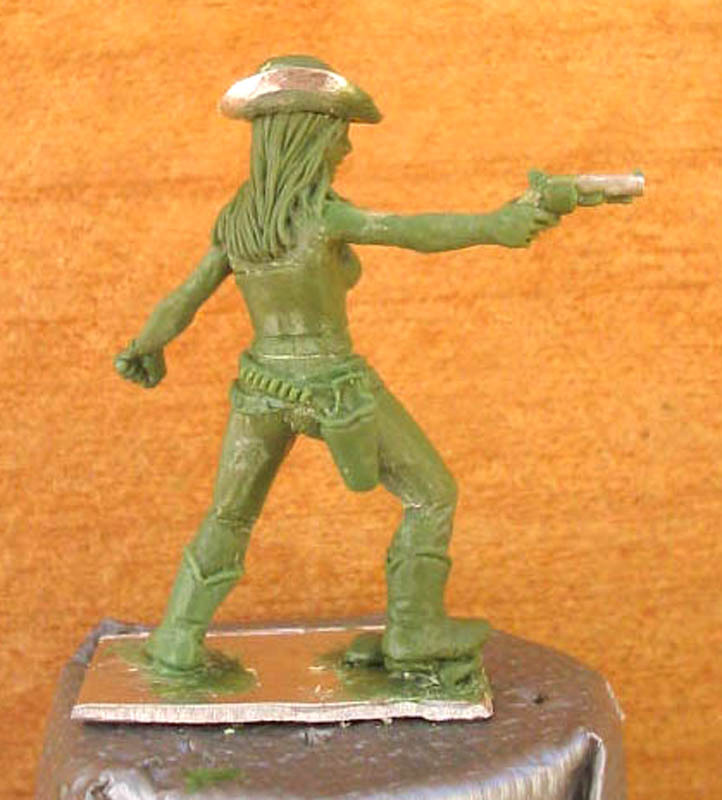 Hawgleg Publishing, in association with Scale Creep miniatures, is proud to release its first miniature this weekend at Cold Wars: a gun-totin’ lethal lady who’s ready to prove she can outshoot any man in the Wild West. 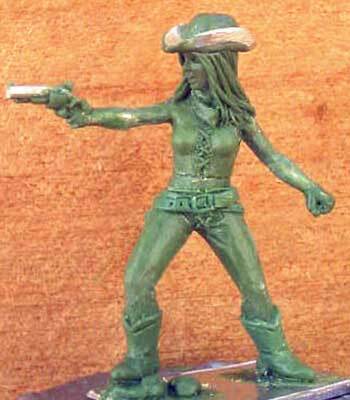 The miniature is nick-named “The Gutshot Chick,” although her “official” name is “Arizona,” after the name of the character. The original inspiration sketch is on page 84 of the Gutshot Core Rule book, which is where Mark Severin of Scale Creep Miniatures first saw her and approached Hawgleg about the possibility of doing a miniature based on her. Arrangements were made and the figure was sculpted by Aaron Brown of Black Crab Sculpting Studio (www.blackcrabsculpting.com) from images provided by Mitchell. The miniature will be available at Cold Wars from the Scale Creep Miniatures table, and through their Website. It is FREE with the purchase of the Gutshot Core Rule Book, or it can be purchased separately for $5. 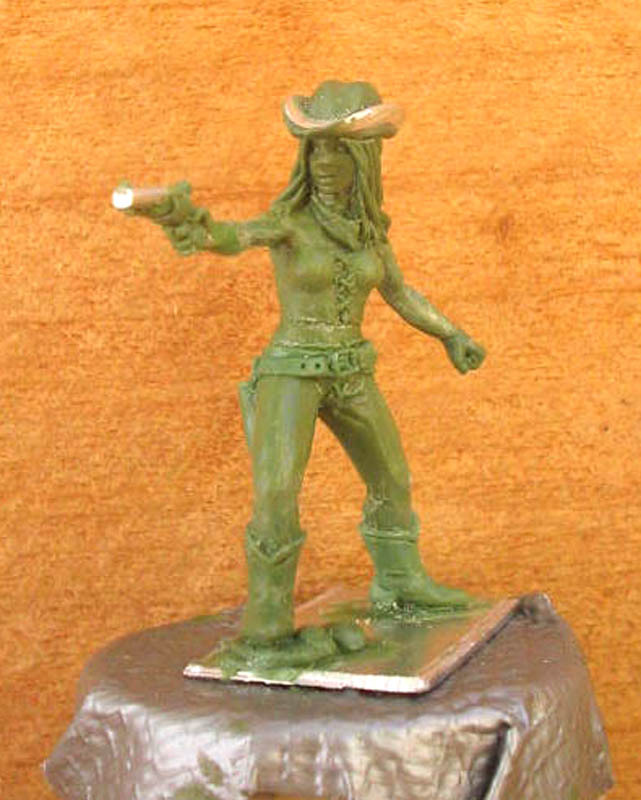 After Cold Wars, The Gutshot Chick will be available exclusively online through Scale Creep miniatures for a month or two while Hawgleg sets up its shipping facilities to handle mailing miniatures and additional products. Information will be posted as soon as it is available. Want more of the Gutshot Chick? View another green photo here, and another here, and a full-size of the above photo here..